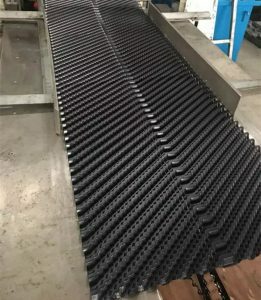 In the industrial production process often use cooling tower cooling water to industrial waste washed out, the cooling tower using the cooling water carried in the tower and the air heat exchange, the waste heat to the air to go. Cooling Take the air for the heat exchanger and thermal evaporation of cooling water management has a unique here, the cooling is to use water filler, the function is to enter the water cooling tower fan or splash water to form a water film, filler using polyvinyl chloride Information or modified polypropylene material production. Increase the time and area of water and air to make contact with water, get better cooling tower lower body. The cloth has a sink that collects the cooling water under the package for storage and adjustment of the bottom of the tank, some of the water pipes and drains. Cooling tower in the use of the process, the long years of weathering and dust, the use of cooling take a lot of dirt inside the ride, the use of a large number of cooling quality decline, seriously affecting the cooling effect, accumulation of impurities and filler aging. These will affect the life of the cooling ride, you must regularly carry out cleaning work on it. So as to adapt to long-term use.